Cross posted from the Frontier Group. Twenty-five years ago this spring, I was a fresh-faced undergrad at Penn State enrolled in a course on existential threats to civilization, including climate change. We knew then (and yes, with a reasonable degree of certainty we did know) that emissions of carbon dioxide and other greenhouse gases were causing the earth to warm in ways that could prove catastrophic. We also knew that travel on America’s roads was a leading source of greenhouse gases on a global scale, and that transportation infrastructure decisions were capable of encouraging the use of high-carbon modes of travel that contribute to the warming of the planet. Since then, an entire generation of Americans has been born, grown up, and sat through unnerving college lectures. America has added more than 715,000 new lane-miles of public roads (the rough equivalent of building a 255-lane wide road from New York to Los Angeles), and we have spent an additional $2.6 trillion (2014$) in capital expenditures on our highway system. Since those sunny spring afternoons in 1991, America’s transportation system has spewed more than 43 billion metric tons (carbon dioxide equivalent) of greenhouse gases into the atmosphere, contributing to the mounting damage from climate change that is now being experienced around the world. So, how then to take the U.S. Department of Transportation’s (U.S. DOT) move last week to begin consideration of rules that would set non-binding performance measures for greenhouse gas emissions from transportation? Does it represent an important policy opening or a huge disappointment, given the scale and speed of climate change? Time will tell and, as NRDC’s Deron Lovaas suggests in the comments to this Streetsblog post, the Obama administration’s announcement last week is merely the opening bell in what is sure to be an intense fight over how strong the new greenhouse gas performance measures will be and what format they will take. 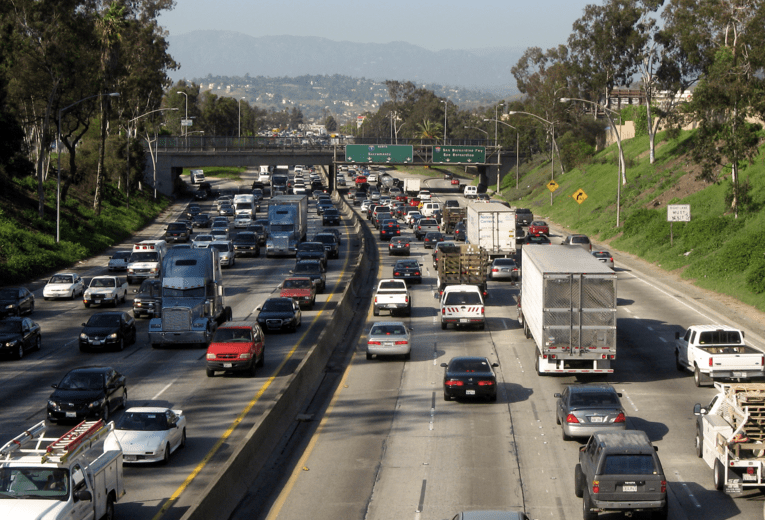 Regardless of the ultimate form of the rules, however, the Obama administration’s action is significant, if only because it signals the renewal of public debate around the connection between transportation infrastructure decisions and global warming. These two topics – transportation infrastructure and climate policy – have long been eerily disconnected from one another. Last December, for example, Congress enacted the highway-heavy FAST Act transportation reauthorization bill, amid virtually no public debate about its climate impacts, at virtually the same moment that President Obama and other world leaders were setting bold new targets for greenhouse gas emission reductions at the Paris climate talks. Transportation policy-makers in most states and at the federal level have simply never seen it as their business to consider, much less act to reduce, the climate impacts of their infrastructure investment decisions. The Obama administration’s actions last week, however tentative, suggest that that is about to change. And if you want to know why that’s important – and why the road building lobby is girding for battle – recall a little pipeline project called Keystone XL, which sparked a debate that started out being about the things infrastructure debates are usually about (e.g. local impacts), and then suddenly, and decisively, transformed into a national debate about climate change. Will we come to debate highway expansion projects that fuel carbon-intensive land uses and travel patterns with the same intensity as we did Keystone XL? I’m not sure. But the creation of greenhouse gas performance metrics will help to ensure that at least they are debated. And that is a big step forward. Let’s be clear: In order to meet the goals of the Paris climate agreement and prevent the worst impacts of global warming, the United States will need to virtually eliminate greenhouse gas emissions from transportation by 2050. Ideally, every state would be planning – right now – for how to make that monumental and rapid transition. By that standard, the Obama administration’s actions are far from sufficient (and the correspondingly problematic congestion performance measures could actually move us backwards). But, as they say, the first step to recovery is recognizing that you have a problem. The Obama administration’s actions last week are the first step toward coming to grips with the impact of transportation infrastructure decisions on the climate. After more than a quarter-century of widespread silence and denial – and with the enormous pressure the administration has likely faced from the road lobby to maintain that silence – that is an important and necessary step forward, and one that’s worth taking time to appreciate and applaud. Noble effort, but this idea is already past its prime. As evidenced by the avalanche of orders for Tesla Model 3s and the rash of offerings from other companies, electric cars are going to quickly become a decent portion of the vehicle fleet. By time they finish rulemaking, get the plan out, and it begins to be implemented, I wouldn’t be surprised to find electrics making up a third of vehicles on the roads and continuing to grow. At that point, the GHG argument against highways will be largely without merit. Well, I doubt if electric cars will be a significant portion of the fleet anytime soon, they aren’t even 1% of the fleet currently. Even if they were, it’s not like they solve GHG problems if fossil fuels are still being burned to produce electricity. Do you not keep up with current events? Within the last month, Elon Musk has sold out multiple years’ production of a car that isn’t even ready for market for at least another year. The automotive industry is taking notice and I can guarantee you that by 2020, there will be plenty all-electric models available for the market. I would venture to say that they will be inching past 5% of total vehicle fleet, especially in places like CA. The power generation argument also not a great one. Point-source pollution is far easier to regulate and control than mobile sources like cars. At the same time, many utilities are investing in renewables and doing so at such a rapid pace that last year, renewable installation actually surpassed conventional. Many people are also getting a rooftop solar panel with their Tesla, but the net result is the same: carbon-based electricity production is waning. Meanwhile, assuming that USDOT had proposed a carbon-based rule today, it still has to go through the formal rulemaking process and I wouldn’t expect the rule to even actually be ready before 2019 at the earliest. Then, it would have to make its way down to the project level and there will undoubtedly be many that would already be past the point where the new rule would be considered. As a result, I’d estimate that it won’t affect projects that are set for construction up to at least 2024, a time by which it doesn’t seem unreasonable to expect that electrics will be climbing through 20% of the vehicle fleet (at least that which is driven regularly) and 40% of new sales. The GHG argument against highways will be very relevant even if we have a 100% electric vehicle fleet tomorrow. Renewables are not about to overtake carbon-based electricity generation anytime soon, and the GHG impact of highway-enabled land use is enormous. Revealing. The streetsblog mindset isn’t primarily about improving transportation. Rather, the editorial reach implicates “GHG impact of highway-enabled land use”. Propaganda, behavior modification and master nanny-planning of lifestyles.. don’t be shy. Sadly, your anti-lifestyle editorial component serves to alienate factions of those truly wanting better transportation. Actually, unless you have three honorary doctorates, then he has you beat. Portland Suburb: To Fight Climate Change, Expand Highways!